I somehow missed this Victorian Premier’s Award winning novel when it was released a few years ago but am very glad to have happened upon a copy now. At its core is Philip Trudeau, once a high-flying financial journalist and hero to impressionable students who has fallen on hard times. He lost his job at a prestigious newspaper and even did some time in prison and is now working – barely – at a suburban rag that does little more than have a few articles around all the real estate advertisements. When a young boy is hit by a train and killed Trudeau at first only feigns interest in telling his story. But the boy’s death and its apparent links to other people and events seem to follow Trudeau and compel him to investigate, no matter how much cheap grog he drinks to forget. At first I thought I knew exactly where this book was going to go with its alcoholic loner central figure but Gadd was soon surprising. Perhaps the most surprising thing is that there are actual ghosts in GHOSTLINES and I didn’t mind at all though I normally eschew all things mystical. This paranormal element is not overwhelming though and it does add suspense in terms of forcing the reader to consider what is real and what isn’t. Trudeau is in some ways the typical protagonist of a crime novel but he is also a lot more believable than man of his brethren. When we learn why his career, and his personal life, have crumbled, turning to the bottle seems like a sensible, if unhealthy, choice. I suppose I felt a mixture of pity for and annoyance with him for much of the book but I could completely understand why he was behaving the way he did. And we do get to see that the path of self-destruction can be…at least temporarily interrupted if not entirely abandoned…in Gadd’s deft depiction of Trudeau’s eventual commitment to investigating the story that is demanding to be told. GHOSTLINES ends up offering a complex and compelling tale depicting an anti hero’s version of redemption set against a backdrop which involves art, fraud and financial shenanigans in a very recognisable and quite evocative Melbourne. An absolute treat to read. Scribe Publications 2008, ISBN 978-1-921372-04-9, 283 pages. Philip Trudeau was once a journalist with a future, working for Australia’s premier financial newspaper. That was before. Now he’s down almost as low as you can get, holding down a desk on a local suburban rag. The death of a local boy on his bicycle on a level crossing late at night looks an open and shut case. All Philip needs to do is get the story, get some local comments, and then his job is done. The next morning he visits the boy’s mother, his school, and writes his story. Job finished, or so he thinks. His editor is pleased, until a rival paper picks up on angles he never thought of. And just what was Michael doing dodging around the barriers at that time of night? Where had he come from? And where was he going in such a hurry? Philip’s training as an investigative journalist rises to the top and strange elements of a complex story begin to emerge. Philip is contacted by an 80 year old antiquarian with an obsession who wants a ghost writer to write his memoirs. As we would expect the various threads of the novel converge the longer Philip’s investigation continues. And then someone from Philip’s past reaches out to stop his probing. 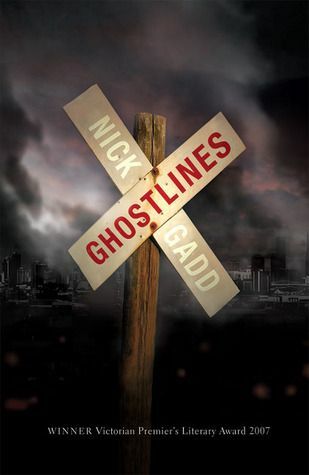 GHOSTLINES is Australian writer Nick Gadd’s first novel. For an Australian novelist it has an unusual blend of crime fiction and the paranormal. I’ve actually had GHOSTLINES on my shelves for some months, and I’m not sure why it has taken me so long to get it down. It is well worth looking for. GHOSTLINES won the Victorian Premier’s Literary Award in 2007 for an unpublished novel, and the Ned Kelly award for best first fiction for 2009. Nick Gadd has his own blog site: The writer in disguise.